We’re sorry to report that there are no sensory deprivation chambers to try out in the Exhibition hall this year, but until the day that those arrive, you can try these spots out for a little peace and quiet when you’ve been stuck in the crowds of the midway just a little too long. 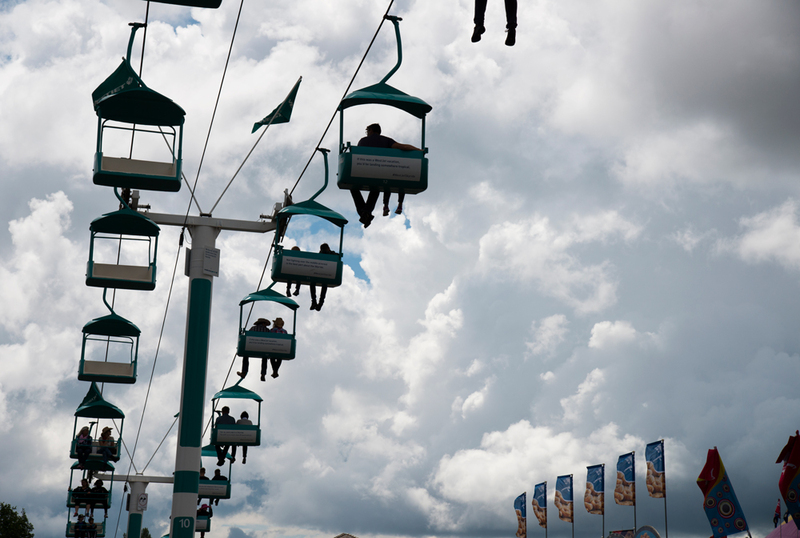 One the Skyride you coast blissfully above all the chaos of the midway below you. It’s especially nice at the end of the day when you just couldn’t possibly walk the length of the park one more time and want a lift to the Erlton exit. Plenty of shade trees and a distinct lack of carnival games make Weadickville a welcome oasis in the park. Vendors located behind the vintage storefronts sell all the basics – hot dogs, cold drinks, ice cream and candy for lower prices than on the rest of the midway, and there are lots of picnic tables to relax at. 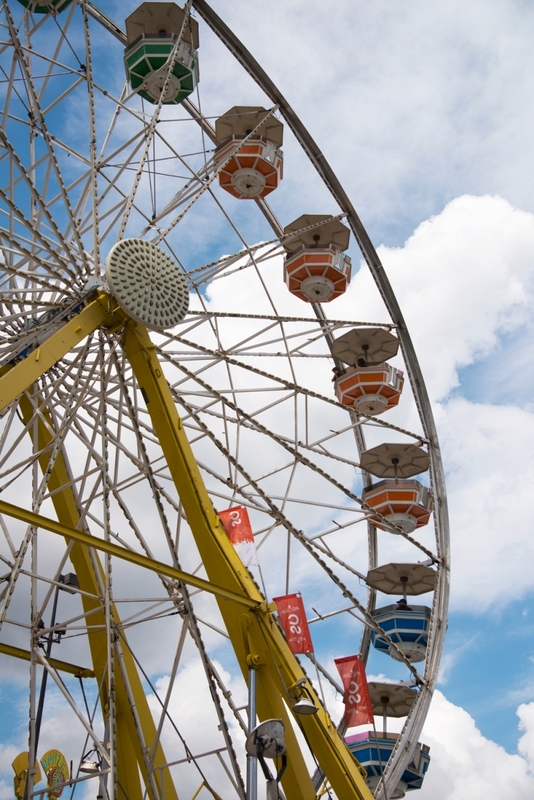 If you just need a quick break from the crowds, there’s always the ferris wheel. It’s a quiet, calming ride with great views, in spacious shaded cars. 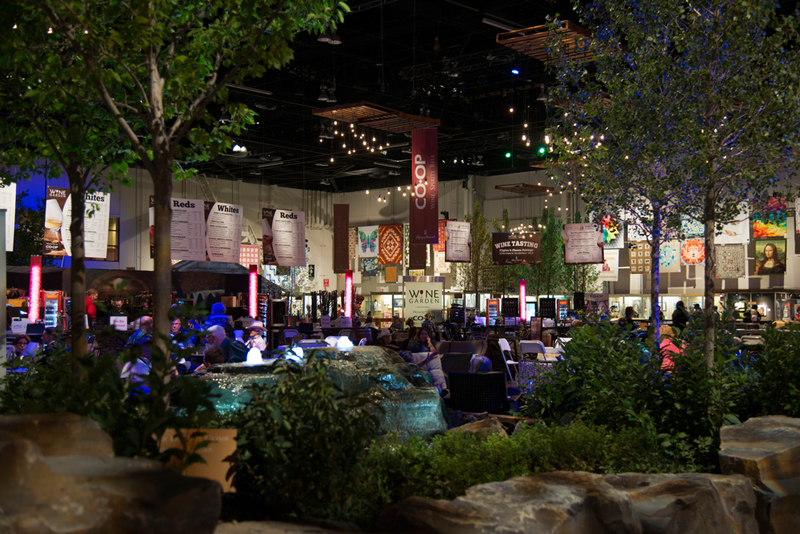 The Wine Garden is an oasis within an oasis (The Western Oasis, that is.) You walk through art exhibitions to reach it. The lights are dim. There are trees and water features. They serve wine and charcuterie. It’s almost not even the Stampede. The new Enmax Park is an island of calm. 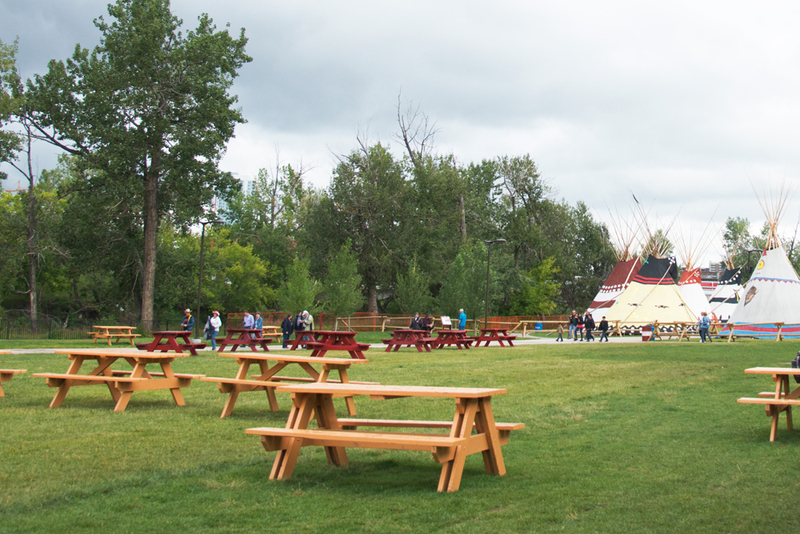 The huge green space runs along the Elbow River at the north end of the park, and is the new home for the 26 tipis of the 5 Nations of Treaty 7 (moved from the previous location at the southern end of Stampede Park). 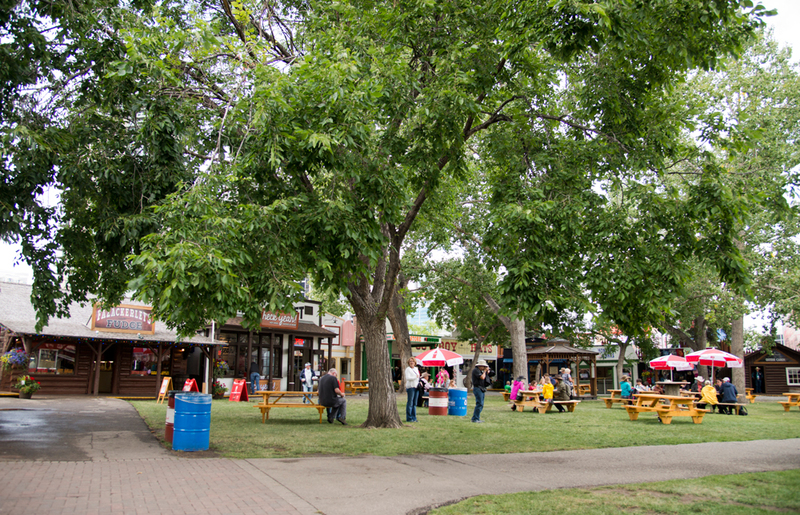 There are plenty of picnic tables, and the Bannock Booth is nearby if you’re looking for lunch or dinner. Inside the big circle of tipis is another wonderful calm spot. You’re just across the river from the main park, but it’s quiet, and it’s a great place to let kids run around – no big crowds for them to disappear into. 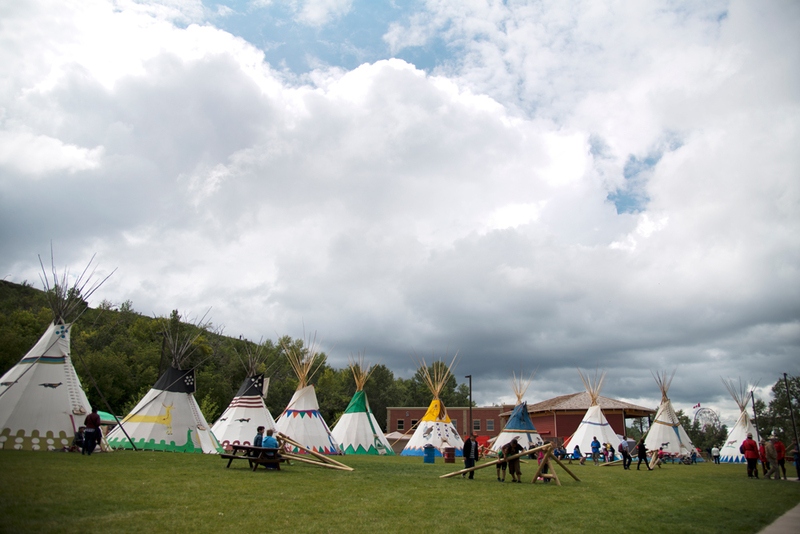 You can wander around and visit the open tipis (look for the signs above the doorways). Close your eyes and breathe in the fresh air with a hint of wood smoke from the demonstration cooking fires. Those people up there look relaxed, right? 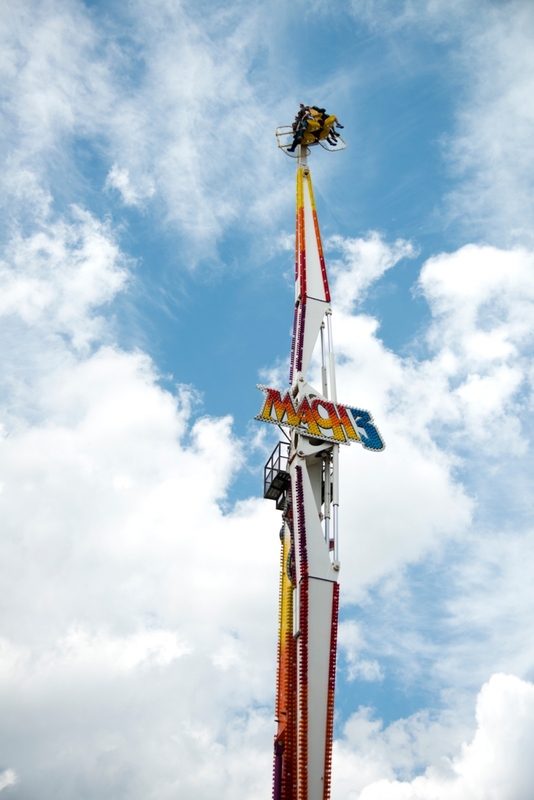 Way up there, in the calm blue sky surrounded by fluffy clouds? Well, maybe not so much, judging by the faint screams of terror/excitement that we can hear from down here, sitting on this nice comfy bench roughly one foot off the ground, in the shade. There always seems to be a small crowd relaxing on benches that dot the midway, near the really wild rides, perhaps feeling even more relaxed in comparison to the people being tossed about on the Zipper.